Chesterfield FC director Ashley Carson has revealed the club are under investigation over payments made to two former players. And the Spireites have also been reported to the Central League for playing ex defender Liam Graham under a false name. The Derbyshire Times reported in May that Carson has discovered that the wages of Jake Orrell and Myles Wright were paid by a private academy associated with the club. Chris Turner, then-CEO of Chesterfield FC, had set up the academy – CFC Development Schools Ltd – alongside a former non-league footballer called Liam Sutcliffe. That business has since been liquidated and Turner was made redundant by Chesterfield earlier this year. Wright made only one appearance as a Town first team player, while Orrell played four times for the club. Both left Chesterfield last summer when Orrell turned down a new contract to sign for Hartlepool United and Wright was released. EFL clubs are also bound by the Salary Cost Management Protocol which limits spending on player wages to a percentage of club turnover. Carson has today confirmed that the game’s authorities are investigating the payments. “The club is currently under investigation by the EFL and FA for two potential rule breaches,” he said. “For some reason the academy paid the wages of Myles Wright and Jake Orrell for a season. “Both were registered under CFC and made appearances for us, therefore we have breached FA rules. Both Carson and the club’s head of football operations Sally Swain have met with the EFL compliance officer regarding the matter, which Carson says will now be discussed by the FA. And the club is also facing questions over New Zealand international Liam Graham, who played in a number of reserve games under false names. Graham, who was released at the end of last season and unsuccessfully trialed for a return this summer, appeared in the Final Third Development League Cup against Notts County, Grimsby Town and Rotherham United under the name Jake Hudson. He was also given the name Tom Jarrald in a Derbyshire Senior Cup game against Glossop North End. All of the appearances in question came between November 2015 and February 2016. 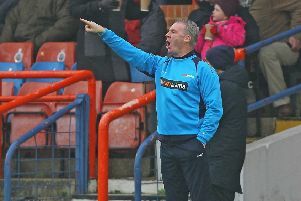 Carson said: “We have also been reported to the Central League for playing Liam in six matches under a different name. “This is not an EFL or FA breach, but falls under the Central League. The company secretary, who is running affairs at the Proact, insists the EFL are happy that he was not involved directly in either rule breach. “I have no wish to try and hide either issue and I will report fully on both when I know more myself,” he added. The Derbyshire Times has contacted both the EFL and FA for comment. Chris Turner has also been contacted for comment.